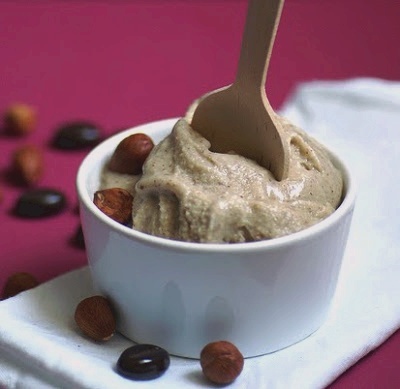 Hazelnut Ice Cream A delicious way to use hazelnuts! Preheat the oven to 350 F. Place the hazelnuts on a cookie sheet and bake for 15 minutes. Cover and let stand for 15 minutes. Wrap the hazelnuts in a kitchen towel and rub to loosen the skins. Cool completely. Finely grind the hazelnuts in a food processor and set aside. Scald the cream in a saucepan. Whisk the egg yolks and sugar in a bowl. Gradually whisk in the hot cream. Return mixture to the saucepan and stir over medium heat until custard thickens and leave a path on the back of the spoon when you draw your finger across. Do not let the mixture boil. Remove from heat stir in the vanilla. Strain mixture in a large bowl, cover and refrigerate. Transfer the mixture to the ice cream machine, add the nuts and process according to manufacturer’s instructions.